Sage Pay is a popular payment gateway service with more than 15 years of market experience. The flow of money across businesses is one crucial variable. Most businesses in the modern days are looking for fast and secure ways to transfer money from one place to another. 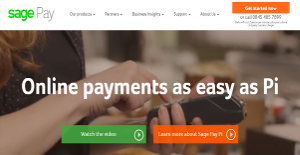 This is where Sage Pay becomes such a handy tool with its highly efficient services. Sage Pay started its operations in 2001. It initially targeted medium and smaller businesses providing them easy solutions for payment processes. It addressed to the needs of several types of businesses which is why it got widely accepted over the years. As of now, Sage Pay has developed from being a small company in UK to one of the major payment processing services across Europe. It brings viable solutions that meet your business needs with top class security. Modern business owners will understand that the number of options for collecting and making payments have largely evolved. Gone are the days when it was simply cash transactions. Since most businesses have turned digital, you have the options to collect payments online. The process is quite simple and secure too. There is also a payroll feature available which makes things even smoother. No longer do you have to at the desk to collect payments. Sage Pay allows you to collect face to face payments through card terminals. It’s a handy tool for stores and businesses that use POS systems. You get a highly interactive touch screen system with clear and simple display making your job not only easy but fun too. There is also a web based virtual terminal which allows you to collect payments over the phone. Processing mail orders becomes easier because there is lesser or no paperwork involved. The web interface is also intelligently designed to make sure that the users don’t find it difficult working with this product. Automated mechanisms for invoice payments along with comprehensive customer support makes Sage Pay a much safer and preferable option ahead of other payment processing services in the region. This is why, some of the top businesses in Europe have been clients to this amazing and innovative service. If you are interested in Sage Pay it may also be a good idea to examine other subcategories of Best Payment Gateway collected in our database of B2B software reviews. Each organization has different requirements and requires an application that can be customized for their size, type of workers and clients, and the particular industry they are in. For these reasons, no platform can provide perfect tools out-of-the-box. When you look for a software product, first be sure what you want it for. Read some Sage Pay reviews and ask yourself do you desire basic functionality or do you want sophisticated features? Are there any industry-specific features that you are seeking? Obtain the answers to these questions to assist your search. There are multiple factors that you need to reflect on and these include your budget, specific business requirements, your company size, integration requirements etc. Take your time, check out a few free trials, and finally zero in on the system that offers all that you need to improve your firm competence and productivity. How Much Does Sage Pay Cost? We realize that when you make a decision to buy Payment Gateway it’s important not only to see how experts evaluate it in their reviews, but also to find out if the real people and companies that buy it are actually satisfied with the product. That’s why we’ve created our behavior-based Customer Satisfaction Algorithm™ that gathers customer reviews, comments and Sage Pay reviews across a wide range of social media sites. The data is then presented in an easy to digest form showing how many people had positive and negative experience with Sage Pay. With that information at hand you should be equipped to make an informed buying decision that you won’t regret. What are Sage Pay pricing details? What integrations are available for Sage Pay? If you need more information about Sage Pay or you simply have a question let us know what you need and we’ll forward your request directly to the vendor.